There is a direct link between dependency ratios and tax rates, and this limits the extent to which a mature human society can be capitalist or commercially-dominant. First of all, let’s assume that the total activity necessary to support an individual person remains constant throughout their life. Babies and really old people need lots of care and attention, young kids in school need lots of resources, and working age people consume lots of resources in their productive activities, like commuting and training, as well as needing help with all the other stuff they don’t have time to do because they are working. So if every dependent uses 1 unit of activity, that unit must be generated by a productive person. The more old people there are, and the longer we have to educate our children to make them productive members of our society, the higher the “dependency ratio”. That is the percentage of people of productive, working age versus the percentage of people who are too old to be productive, or who are too immature to be productive. If 50% of people are dependent, then the remaining 50% have to pay 50% of their production in taxes to provide for the 50% that aren’t working (and they have to generate 2 units of wealth, 1 for themselves and 1 for the taxes to pay for a dependent). Pre-industrial societies had low dependency ratios (~27%) because people died before they stopped being productive and young people became productive members of society at a very young age, at 12 years old or even younger. Around 1900 in the UK this ratio went up to 34%, because young people had to stay in school longer to be effectively productive, but there was no increase in overall production because life expectancy remained low at 47. In 1950 the ratio dropped to 31% because life expectancy rose to 70, adding 18 years of productive lifespan and only 5 years of retirement. By 2000 the ratio leapt up to 44%, because life expectancy rose to 82 (adding 12 dependent years) and most young stayed in education through their early 20s. Once life expectancy reaches 90, and young adults stay in education until they are 22, and even if people are productive until the age of 67, the dependency ratio reaches 50%. In practice every human society has around 5% disabled and sick people of productive age at any given moment, so we are already at or above the 50% dependency mark now. Now we have dependency ratios of around 50%, and that means tax rates will have to approach 50% to pay for our social security (i.e. to pay for all the non-producing young, old and sick). 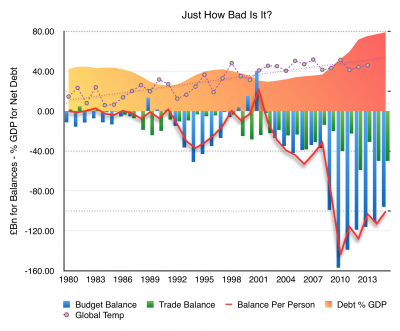 Trouble is that tax rates above 40% reduce economic performance, and create a downward spiral that cyclically reduces economic performance and tax revenues. Most of the factors in this equation are beyond our control: the cost of materials is fixed globally, the cost of energy is high, and to invest in renewable energy also costs lots of money. The only factor that is really under our control is how much we pay ourselves. The more we pay ourselves, the more expensive we make our lives. Because so much of what we do and what we need includes the labour of someone else, pushing up wages just makes life more expensive. 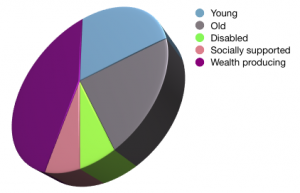 Because a large-scale human society is effectively dependent on socialised security (as opposed to family or tribal security), and because social security services contain a high proportion of labour, the cost of labour is directly related to the amount of taxes that need to be raised to pay for social security. When social security is provided by family or tribe, the vast majority of the labour is not paid for, it is provided as a social service in a conscious or unconscious trade for mutual security. Emulating that social trade of “labour for security” is the key to making our modern, large-scale societies affordably secure. But how? The answer is more simple than you might imagine. Provide social security without charge. Just meet the basic survival needs of every person, and they will accept that security in lieu of fully-loaded wages. It’s a trade we have made consciously and unconsciously for generations upon generations, it is built into our DNA, and it is millennia older than any modern invention of the monetary-industrial-technical-information age. In fact it is so old and so deep that it has probably just floated past you, without you realising that it is the solution to our modern economic dilemma. So here it is again: provide everyone with the assurance of social security for free, and we will make our entire society affordable. Wages will come down, and we will be happy with that. We will accept the assurance of shelter and a decent meal in lieu of a surprisingly large portion of the wage we would have otherwise demanded without that assurance. And in so doing we make our social security cheaper, and we make investment cheaper at the same time. Everything that contains labour becomes cheaper. The social trade of “labour for security” decreases the percentage of total activity in our society that is exchanged for money, i.e. is commercial. 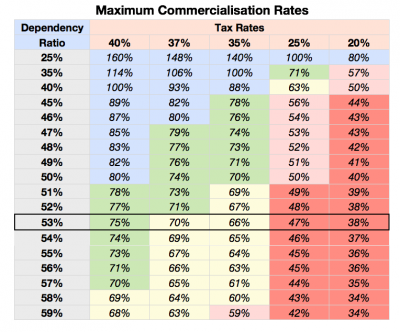 This table shows the extent to which all activity in a society can be commercial depending on the dependency ratio at a specific tax rate. The higher the dependency ratio, the higher the tax rate has to be to pay for the dependents. The less activity that is commercial (exchanged for money), the lower tax rate can be, because taxes are only needed to pay for the portion of dependent support that is paid for with money.